I’ll admit this up front: I’ve never been a big-time basketball fan–until this season. Although I was fairly decent at shooting hoops and even was a basketball cheerleader in high school, I used to sleep through the games on TV. However, once I gave basketball a chance and started watching games with Antonio, I gained an appreciation of this fast-paced sport and all the athleticism and agility that goes along with it. My favorite part of the game is the players themselves–their dramas and egos. Basketball is full of interesting characters, and for a writer who loves observing people, that’s golden! There was a lot to observe this playoff season, and I was sucked in immediately. But basketball is not all about the drama or even the sport–we can learn important life lessons from the players and coaches by paying attention to their hardships and their successes. Here are 6 life lessons I learned from watching the NBA Finals between the Miami Heat and the San Antonio Spurs. Thanks to my brilliant co-author, Antonio, for coming up with the fresh new concept for this post, as well as the tips! Use your failure as motivation – Last year, the San Antonio Spurs were on the verge of winning the NBA championship. They were up by 5 with 28 seconds left on the road against the Miami Heat. A yellow security tape was brought out to surround the court. The Heat fans started fleeing for the exit. Then miraculously, the Heat hit 2 incredible shots to tie the game and pull off an improbable comeback, and eventually win the title. Instead of pointing fingers and making excuses, the Spurs used the loss to fuel their fire. They came back stronger and more focused. And they won this year in decisive fashion. Trust your teammates – We’ve all heard it before: There is no “I” in Team. The Spurs showed this beautifully. They got all their players involved–not just their “Big 3.” Of course, the Big 3 were their excellent selves, but their role players made all the difference. They played selflessly and put on a clinic in passing, making one amazing assist after another. Patty Mills, the second-year man from Australia, was contributing with his relentless defense, quickness, and 3 pointers just as importantly as Tim Duncan, one of the all time greats. Believe in yourself – Kawhi Leonard, just 22 years of age, had arguably the toughest task in the Finals: guarding the best player on the planet, LeBron James. Not only did Kawhi match LeBron with his effort, intensity, focus, drive, rebounding, and chasing loose basketballs, he also in some cases outplayed him. Kawhi believed in himself, and so did his coaching staff and his teammates, who gave him the opportunity to play free, and shoot the ball. 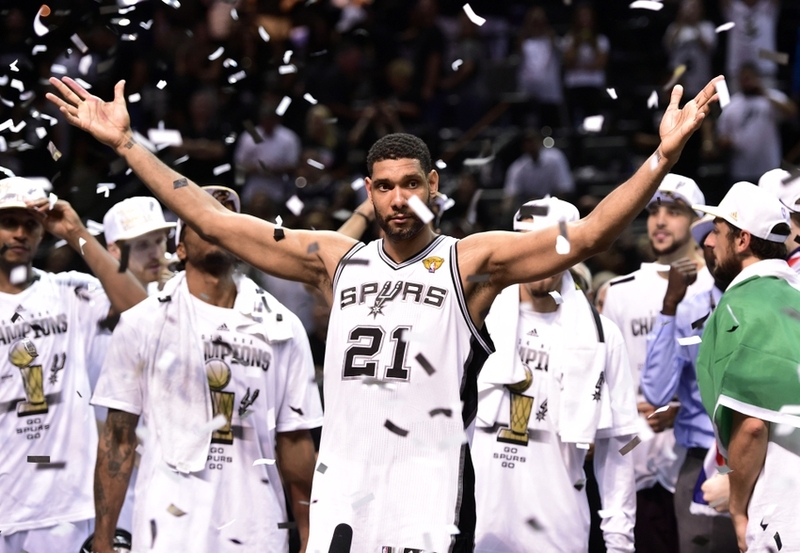 His hard work paid off, and he was rewarded with Finals MVP, becoming the youngest player to win the award since his teammate Tim Duncan did it in 1999. Diversity is key – The San Antonio Spurs are the most diverse team in the NBA. 8 of their core players are international. They have Tony Parker and Boris Diaw from France, Tim Duncan from the US Virgin Islands, Manu Ginobili from Argentina, Tiago Splitter from Brazil, Patty Mills and Aron Baynes from Australia, and Marco Belinelli from Italy. This mini-United Nations of players combined their diverse set of skills, experiences, and attitudes to create the most powerful team in the NBA. In life, diversity allows us to expand our viewpoints and become inspired by ideas outside our norm. Recipe for success! Work with what you have – The answers to the most difficult problems in life often reside inside of us. When the Spurs faced their heartbreaking defeat last year, they looked inside their team, buckled down, and worked harder. Most importantly, they never gave up believing in themselves. When we face setbacks in life, there is often no need to go outside to fix our problems. Many times, we can take a lesson from the Spurs: Look inside ourselves, work hard, and believe. Be humble – Success can often create unwanted side effects–specifically inflated ego and overconfidence. During the NBA finals, there was no better example of this than the comments of Chris Bosh of the Miami Heat. He told a Sports Illustrated reporter that the Heat were going to win Game 5, regardless of the odds, because, “Odds are for people that can’t do it.” The Spurs, on the other hand, went into Game 5 humbly, and their drive and persistence allowed them to come back from a 16-point deficit in the first quarter, and ultimately to win the game! Other bloggers out there, what do you think of these tips? Did you watch the NBA Finals, and if so did you learn anything from them? I’d love to hear your thoughts! Definitely agree with trusting your teammates and and being humble. The Spurs organization is a class act.